Weymouth's Sea Life Adventure Park's Jurassic Skyline Tower is an amazing new way to sea the wonders of Weymouth. Built to coincide with Weymouth and Portland’s hosting of the 2012 Olympic Sailing events, this 53 metres high rotating tower provides unrivalled views of Weymouth Bay, the Sea Front, Weymouth’s historic Harbour and the Nothe Fort. Now part of a bundled deal with the Weymouth Sea Life Adventure Park, with one ticket, visitors can enjoy the amazing wonders of the undersea world of the Sea Life Centre and then rise up over the sea in the Sea Life Tower’s glass gondola. Sit in comfort as you are gently lifted from ground level to the tower’s full height while the gondola slowly rotates to ensure everyone gets the full benefit of its spectacular views. 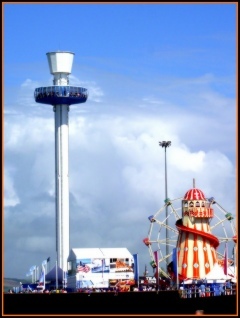 The tower is located about 15 to 20 minutes walk from the Sea Life Adventure Park next to the Weymouth Pavilion Theatre - but don’t worry about finding it, if you find the sea front you won’t be able to miss it. And if you don’t fancy the walk from one to the other, then simply hop on the “Land Train” and let it take the strain for you! The Sea Life Tower is definitely best seen and used on a clear, sunny day, but if your trip doesn’t coincide with one, make sure you go up it anyway! Unless you are desperately afraid of heights or particularly prone to motion-sickness, you’ll enjoy it rain or shine and see Weymouth, quite literally, in a whole new way! Sit in comfort as you are gently lifted from ground level to the tower’s full height while the gondola slowly rotates to ensure everyone gets the full benefit of its spectacular views​"
53 metre Viewing tower that turns to give amazing panorama!